7 game schedule, no standings, no playoffs. Scores will not be recorded or published. "5 goal rule" applies. If a team is down by 5 goals they must add a player. In the interest of fair play and sportsmanship please do your best to avoid a "blowout" situation. 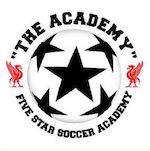 Check out this Soccer (Indoor) league '#01 - U8/U10 Girls Session 3' with Five Star Soccer Academy!